WASHINGTON — New buses that can zip past traffic in their own lanes are the recommended way to help Northern Virginians navigate a congested Va. 7 between Tysons and Alexandria. 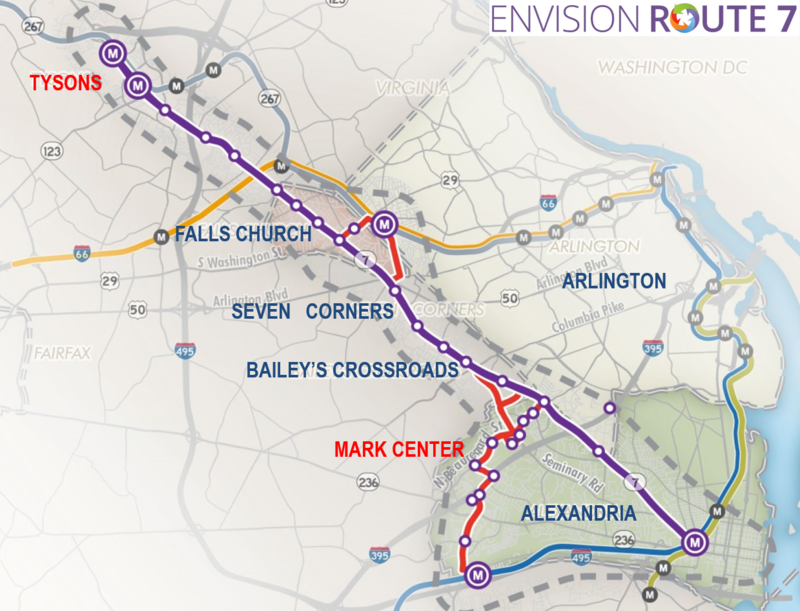 The recommendation that Envision Route 7 will present Thursday to the Northern Virginia Transportation Commission would establish a bus rapid transit line, including stretches with enhanced bus stops along dedicated bus-only lanes, between the Spring Hill Metro Station in Tysons and the Mark Center in Alexandria. The line would run about 11 miles and also connect to the East Falls Church Metro Station and pass through areas such as Seven Corners. The study had also considered building light rail along the route, but found that the significant additional costs would not draw enough riders to justify the upgrade. As presented, the proposed bus route is expected to draw 9,500 new transit riders each day, at a construction and related cost 70 percent less than light rail and operating costs about 40 percent lower than light rail. 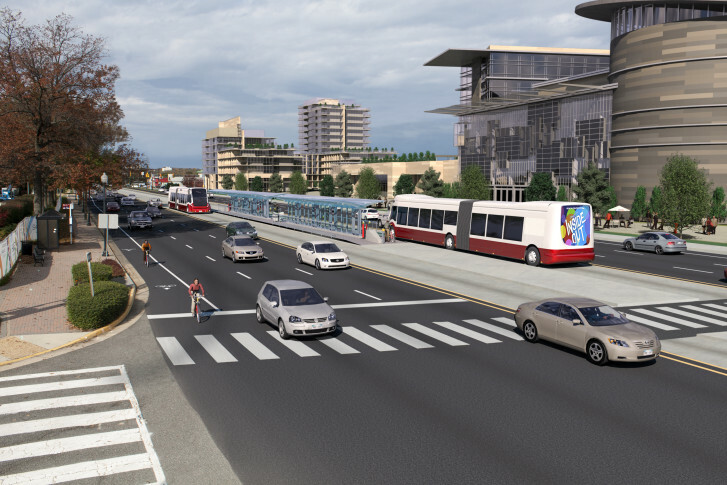 “While the travel demand model results showed slightly higher ridership for LRT, the cost to build and run the service made BRT a more cost-effective option,” a briefing summary says. “The recommendation to connect BRT service to the East Falls Church Metro showed an increase in ridership by 38 percent. Terminating the service at Mark Center, as opposed to the King Street Metrorail Station, will result in a small — less than 10 percent — reduction in riders,” it says. While most riders would be expected to use only a part of the route, traveling the entire 11-mile stretch by bus today can take an hour or more, while the trip can take as little as half an hour by car if there is no traffic. With traffic during rush hour, a car trip may not be much quicker than the bus, which can also get held up. Metro has identified slowing bus speeds across the region as a significant obstacle for bus services in the region. With bus-only lanes, like those that have opened along Route 1 between Arlington and Alexandria, buses would be able to bypass much of that traffic to speed up trips. That Metroway service is set to open additional bus-only lanes in Arlington on April 17. The proposed bus rapid transit route along Va. 7 will be back out for more public hearings in June before the version of the plan that will move forward for funding is approved in July. Public hearings will be held June 6, June 7 and June 8; comments can also be submitted through the Envision Route 7 website.